It is very likely that I do not have every conceivable type of book list form. Unless otherwise noted all of the files are PDF files. Fields: title, author, date, and keys to rate the book. 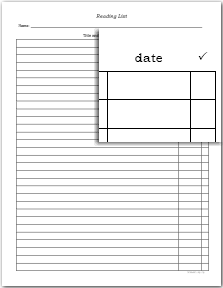 Fields: Call #, Title/Author, due date and check if returned. A roomy reading log. Record the details of seven books with this log. 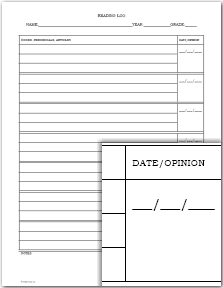 This form is to be used for chapter-by-chapter commenting by the reader. Useful to prepare book reports or for literature analysis. 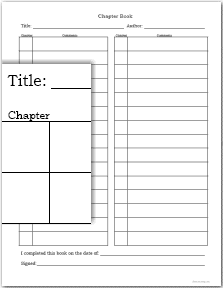 The student can comment on a book which has up to 30 chapters. 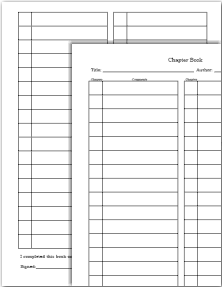 A two-page version of the Chapter Book file. The student can comment on a book which has up to 64 chapters. The following 3 forms are a matched set and were originally made for high schoolers. Books (color) This is a bit more official looking. The header reads, Reading List - Books. 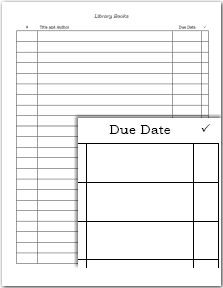 The student name, grade and year can be written under the header. 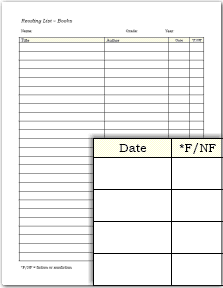 There are four columns labeled: Title, Author, Date, and *F/NF. 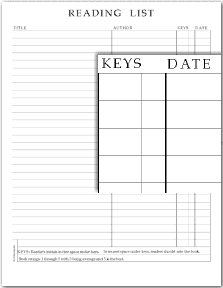 At the bottom is this key,*F/NF = Fiction Nonfiction. Issues (color)The heading on this form reads, Reading List Journals / Periodicals. The headers of the 3 columns reads: Name of Periodical / Journal/ Issue #, Article, and Date. Video/ Plays/ Concerts (color) Header of this form reads: Videos / Concerts / Plays / Live Events. The four column headers read: Name of Event, For Course, Date, and *Type. The key at the bottom reads: *V = Movie or Video; C = Concert; P = Play; N = News; L = Other Live Event.